Leading Them To The Rock : Entertaining, or Hospitality? "I want to entertain in this house." At first I didn't even notice, but the word entertain started to strike me as strange after 5 full laundry baskets of clothes and hearing it in EVERY episode. Entertainment is great, I am a big fan. There is nothing wrong with the word, but the motivation underlying this word was hitting me a new way, especially in contrast with the word hospitality. The focus of entertainment is on the entertainer. The focus of hospitality is on the audience. Am I turning hospitality into a "Look at me!" situation? The gifting of hospitality is a beautiful thing, but we can warp it easily when our pride gets in the way. Do I want my guests to leave saying "Robyn is such a great hostess!" or "I feel really cared for by her and her family."? Hospitality is NOT about perfection. 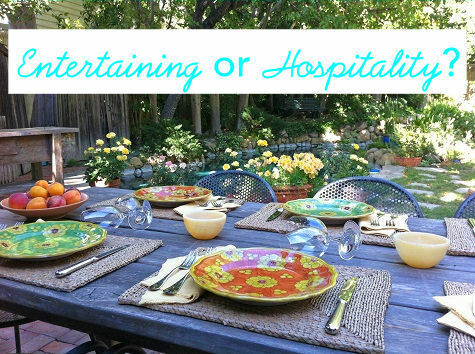 Hospitality is not necessarily about having the perfect pinterest-inspired center piece or perfectly clean house. Can a pinterest-inspired favor or being welcomed into a clean house make some feel cared for, yes it can! Many people feel cared for when you make aesthetic preparation for them, but I really have to check my motivation before endeavoring on this path; am I seeking to build my ego? While lovely prep can make some feel lived, is this avenue to entertaining robbing YOU of joy? If I am slipping into 'Martha Grumbling Mode', instead of seeking what fills others, maybe then I have lost the point of hospitality. There are dozens of opportunities to show hospitality through service, but make sure the people do not get lost in the food, preparations, and "entertainment". Biblical Hospitality is also not necessarily beautiful, let alone perfect. It can be ugly, as you seek to authentically share your life and blessings with hurting souls. Biblical Hospitality is not about my comfort, because it is just not about me. Meeting others needs is the first priority, and sometimes that will make me feel uncomfortable. I really want to be the person who doesn't pause to invite a lonely friend to my house because my house is too small or in it's "natural" state. Some people feel more comfortable in a house that does not look like it belongs in a magazine. On the flip side, my dirty laundry in the living room WILL make some uncomfortable, and feel like I didn't care enough to pick up for them. When wonderful husband comes homes from a chaotic work day, it makes him uncomfortable to walk into more chaos. This is another one of those lines of balance to pray about; how do you prepare your house to make others comfortable, without building your ego or wearing out your spirit? I am guilty as many others when it comes to wanting a bigger house to "entertain". In my 900 square foot bungalow , I can not 'entertain' dozens of people comfortably (trust me, I have tried). A house big enough to have parties is NOT a bad thing, and in many cases it's a huge blessing to friends to have a place to meet. In my wish for a bigger house, I am praying that if God wills that we move to a bigger house someday, we use that house for biblical hospitality, not wordly pride-fueled entertaining. Thankfully God has been working on me, and showing me how much I can show hospitality in this house. Each week, especially during the summer, we host half a dozen neighborhood kids for hours at a time. Most of these kids' parents have no idea where they are, and have never met me. They come from our street, and sometimes several streets away, mostly because 1.) my kids aren't allowed to go to a strangers' house and 2.) I always have water and Popsicles. It is fun that my kids have playmates, yes. It is comfortable to be the unpaid babysitter to kids who do not have the same boundaries and rules my kids do, no...it definitely isn't. But this is where we are called. We live here to provide a safe space to play for the beautiful elementary girls who would roaming around unsupervised otherwise. My friend Louise says, "Food talks!". She is very right. Hospitality very often does include food (Thank you Lord for that). When it does include food, the motivation for a shared meal is so that the person to feels loved and cared for. This can looks a million different ways. People in need of love/care/kindness will feel cared for when you prepare and share a meal with them, no matter the gourmet level of cooking. A busy mom does not necessarily care what you make, but she will care you are allowing her to eat a meal that she doesn't have to cook or clean up afterward. The kids who gather at my house don't care that I buy the cheapest Popsicles, but that I share them. I love to cook for others, but that isn't true of everyone. Does insecurity in your cooking abilities keep you from trying to bless others? Hosting friends for delivery pizza or Chinese take-out at your house can be just as (if not more) fun for that tired mom who needs a break ,or lonely single who needs a friend. Again, it is not about you, it is about them. While hospitality sometimes involves food, it always involves people. Sometimes hospitality involves laughter and game night with a another set of parents in desperate need of adult interaction. Sometimes it involves the kid who can be too rough with your kids' toys, but needs a caring adult to set loving boundaries...while giving him a Popsicle. Sometimes it involves dinner with a grieving widow, or single in your church who would be alone without your invitation. Jesus is our best example of hospitality over and over again. I LOVE that Jesus showed us over and over how much he loved by spending quality time with others. Jesus liked food and wine, but he loved people. He loved his devoted disciples, single people, married people, sinning people.....pretty much any type of person.